I don’t think this cake needs much explaining… The look of it tells a tale of its own… But I’ll admit I struggled with the naming of it… I wanted it to be a blue lagoon cake, but the colors just aren’t right there (hey, it’s hard to work with natural coloring…). I wanted it to be an ocean cake, but somehow it seemed too tropical (sigh, back to lagoon idea!). 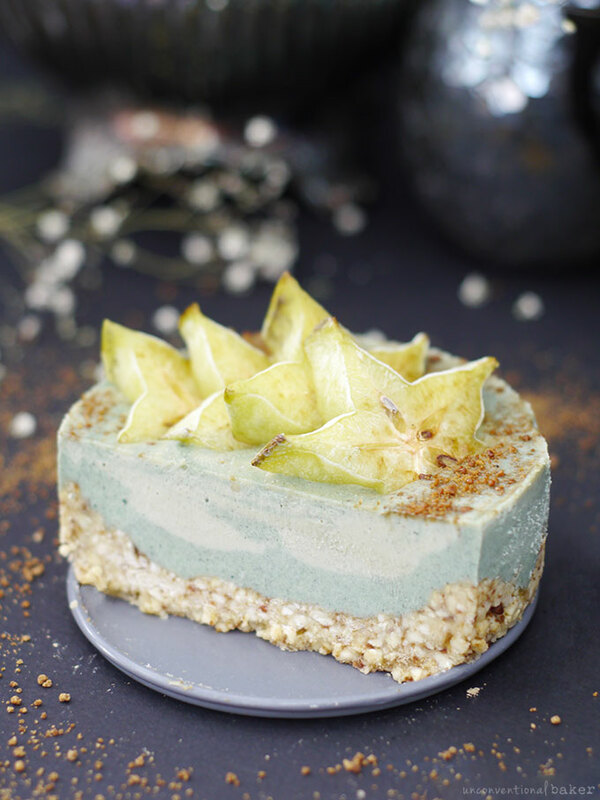 Someone suggested calling it a mermaid cake… I LOVE that name… but I think you’d expect a mermaid hiding somewhere in there (and I’ve yet to come across a mermaid-shaped fruit ;) ). Beach party cake? Beach theme cake? Florida cake… (courtesy of my Floridian friend ;) ). Seafoam something…? Well there you go, I think this exercise in naming probably told you everything there is to know about this pastel-hued raw beach cheesecake. I don’t know what possessed me to make a beach cheesecake to be honest. No special occasion called for it. I blame it on the startfruit I had to use up somehow. And also on the mountains of snow outside (the snow is actually shoulder high at the road after the latest snow storm :S) … and so I’m dreaming of warmer days to come and trying to channel over some of those warm vibes right into my snow frosted forest… And also… thinking of starfruit, the thought that coconut sugar would make good “sand” popped into my mind… and before I knew it I was in the kitchen making this ocean gem. I love how it turned out. Just a simple cheesecake, but so delicate. I could see it working well at a beach-themed party or celebration, or just a birthday party, a baby shower… ? When I think of all those things and think of themed parties, I immediately get visions of those chemically colored icings and treats… They’re always fun to look at, but you won’t catch me eating that stuff these days… So I was so happy this came together naturally — nothing processed or artificial. 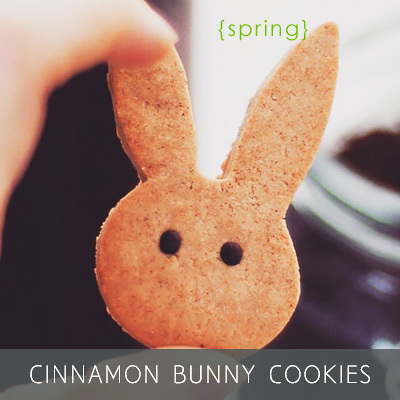 And lots of fun making it (and even more fun eating it ;) ). I feel like this just really celebrates so many elements in nature, in-and-out. That secret I alluded to up above? Not soaking the cashews. Yep, that’s right. Defying raw cheesecake making laws here. Then again, I’ve never been a rule follower anyhow… ;) If you have a Vitamix or a power blender, give that a try for a change. It changes the flavor completely, allowing the cashews to have a much more intense and smooth flavor. 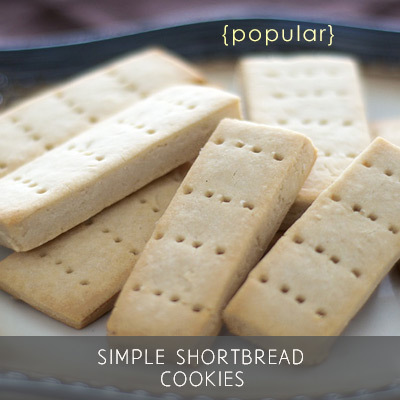 You can use ones that have been soaked and fully dehydrated beforehand. Really what I tried to exclude here is the water the cashews absorb and retain in a cheesecake, but having them activated and dehydrated beforehand is no issue at all if you prefer. 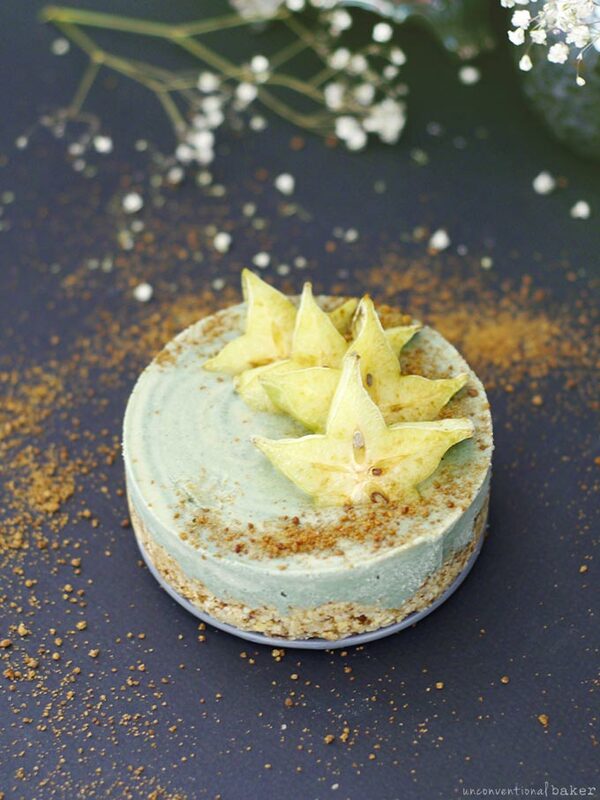 A fun, natural blue-green raw cashew cheesecake embellished with starfruit and coconut sugar “sand”. Vegan and gluten-free. Process all crust ingredients, except maple syrup, into a crumble in a food processor. Add maple and process again to combine. Transfer this mixture into a 5″ springform pan and press down into a crust. Blend all filling ingredients, except for ¼ tsp of the spirulina powder (so only use the ⅛ tsp at this stage), into a completely smooth consistency. Remove about ⅓ cup of this mixture and set aside. Add the remaining ¼ tsp spirulina and blend once again to combine. Pour the blended mixture over the cake crust. Spoon the lighter mixture on top bit by bit, and swirl it in gently. 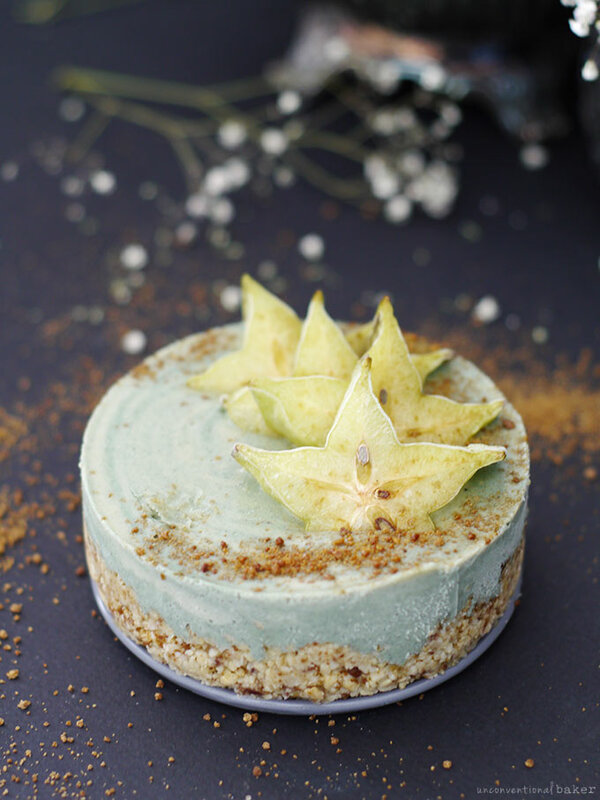 Decorate with starfruit and sprinkle with “sand” if desired. Freeze for 5-6 hours or overnight and enjoy! Keep leftovers frozen. *See notes above recipe for details on whether to soak or not soak the cashews. **I used this 5″ pan to make this cake. To make a 6″ cake, triple the ingredients. Disclaimer: this page contains affiliate links to the 5 inch and 6inch pans to make this cake. I agree with the Seafoam cake that has come up…. Or maybe Sand and Sea cake :) I also agree that you are the most AMAZING AND CREATIVE baker!!! All of your items are beautiful!! And even my super picky husband who eats junk had said that your cakes are great. We have made several. 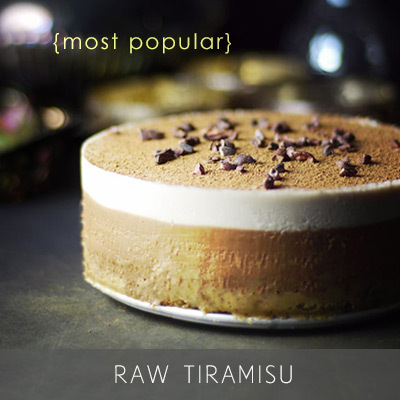 So far, the raw Tiramisu is our favorite… But that is only because I just recently found your site (and your Carmel pecan cheesecake post–my next conquest!!) I love that they are clean. I feel good feeding them to my family. Dairy hates me and it’s not so great for the animals and environment. Keep on un-baking Audrey !! Hello,My name is Helen) sorry but l don’t understand where is a cheese in your cheese cake ? Sorry if I’m asking a stupid question ?? 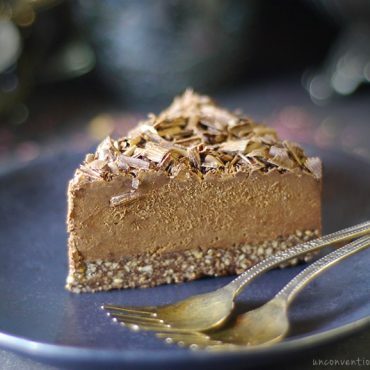 Hi Helen, it’s a “raw cheesecake” which is a type of dessert made from blended cashews. 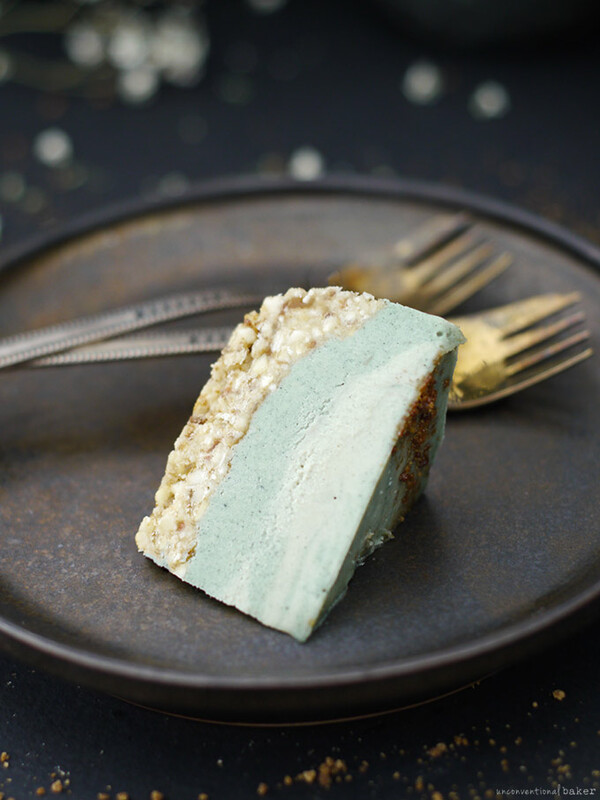 It’s a frozen dessert that mimics the texture of a cheesecake, but is dairy-free. What kind of blender are you using? If it’s not a Vitamix or Blendtec type of power blender then chances are it will struggle with unsoaked nuts. In that case I’d recommend pre-soaking them first without drying. Another issue might be if you have a newer type of low profile Vitamix — the pitcher in these is wider so it’s difficult to work with super small recipes as they tend to not blend well, so the solution is to double the recipe instead. The spirulina I used is by Earth Circle and it’s raw, but pretty much any version should work. You can get the Earth Circle brand on Amazon or iherb if you can’t find it in person in a health food shop. I suspect the color difference would have been because the nuts were not blended super smoothly, or maybe just try using a touch less if your spirulina is very dark for some reason. Can I tell you that you are the most talented food artist in the world to me? 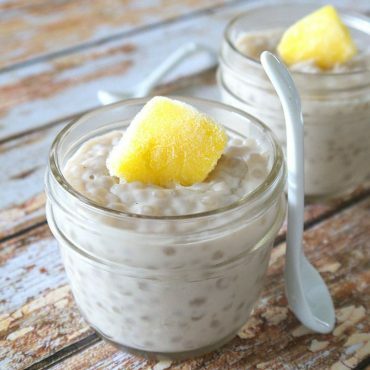 I work in healthcare and what wouldn’t I do to print out these tantalizing recipes and hand it to my patients and tell them to eat real life giving yummy food? It saddens me everytime a patient comes by with elevated sugar and cholestrol levels and admit their failings in curbing down on junk and non vegan ” food”. Sometimes I just flit by your website and imagine eating every one of these delicasies and it just makes me happy, like a boquet of sunflowers in winter. 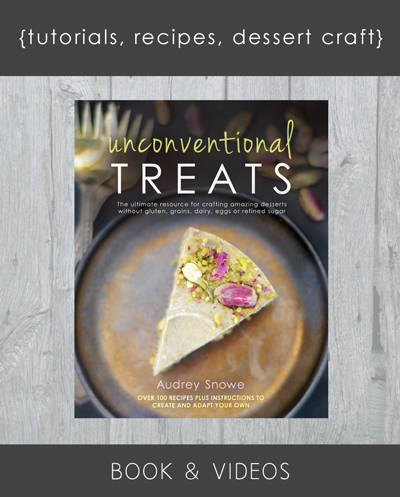 Thank you so much for sharing your creativity, passion and the worlds most spectacular recipes with us. Keep going at it Audrey. Have a blessed day. I get puzzled too when people complain of lack of options or how difficult it is to avoid dairy, refined sugar, etc. I sometimes conclude either I or they must be living in a weird cocoon of some sort ? because the amount of options seems never-ending.. Thanks Bianca :) This was a really fun cake to make. Help! I love this recipe but it’s my first cake ever! Does a 5″ cake pan refer to the height or does this just make a very small cake? I’m confused on the dimensions please help! The 5″ refer to the diameter of the cake pan, not the height. I linked to the 5″ springform pan I use, so you can see all the dimensions there if you’re interested. I also linked to a 6″ pan, which is quite a bit taller and makes a larger cake. I use small cake pans because I make so many cakes on a daily basis that it’s hard for me to keep up with a lot of large cakes — hence the small dimensions. However, for small events and parties I usually make the 6″ and it’s just the right size. Hope that helps, and I’m here if you have any other questions at all. *** Just a note, since it’s your first raw cake, just have one tip that’s good to know as a baseline: 1. make sure all the filling ingredients are at room temperature (if any of them are cold (refrigerated), they’ll make the mixture become too firm (or even solid) in the blender and that will be difficult to work with. So bring everything to room temp before starting. Thank you Tiina! :) I wish I had your magical “blue” for a lagoon cake, but I actually like how soft and seafoam-like this came out anyways. By the way, I *finally* ordered that mushroom coffee. Can’t wait! You could have called it any of those names and I would have still loved this! It’s so pretty and delicate! It really would be perfect for so many occasions. This is so beautiful, Audrey! And also very unique. I just love the color, it really does look like the beach! This is such a beautiful cake Audrey! I think you got the name just right :) Though you could probably get away with blue lagoon as well. 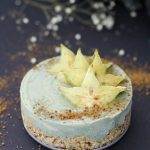 I love that you used spirulina to color it, such a wonderful idea <3 and the starfruit and coconut sand make it perfect! Thanks Lucie :) I love coloring with spirulina –if you get the balance right, you get the prettiest shades. I have to try it, thanks for the inspiration! you are so creative, audrey! 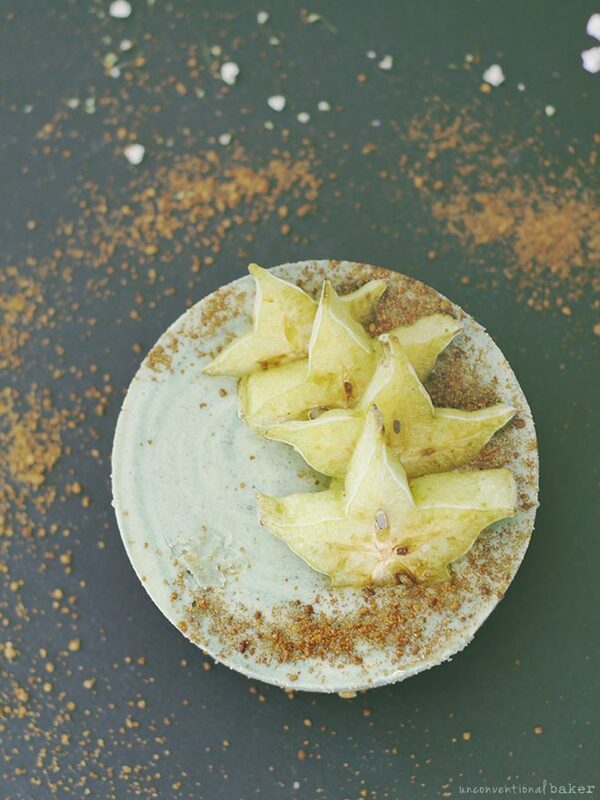 the starfruit and the coconut sugar ‘sand…’ this is wonderful! All this time I’ve been using coconut sugar and didn’t realize that it’s true destiny was to be edible sand! It’s perfect. And I like all the cake names you considered, especially seafoam that just fits. 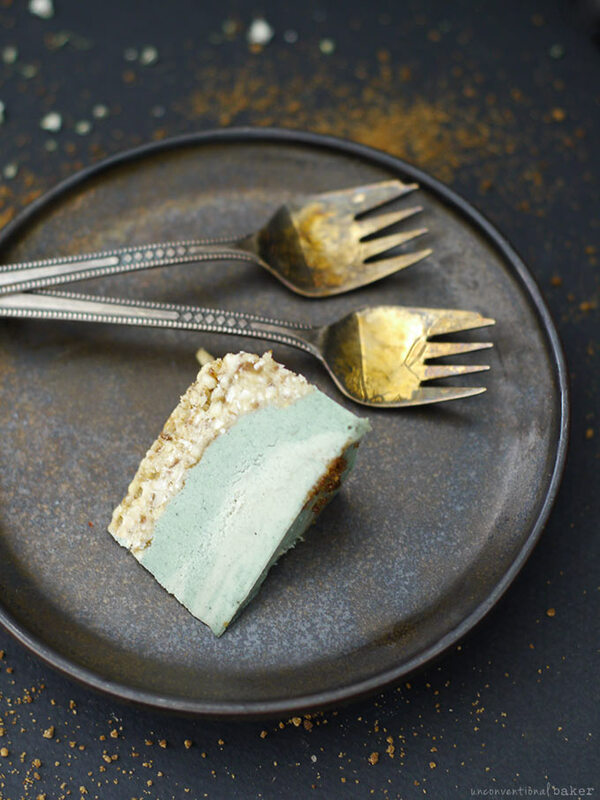 Seafoam Starfish Sweet Sand Sprinkled Swirl Cake…that’s a mouthful! Starfruit is so fun though, it inspires cute creations like this. It looks really neat frozen too. Now if only your weather would take a hint from you beach cake!